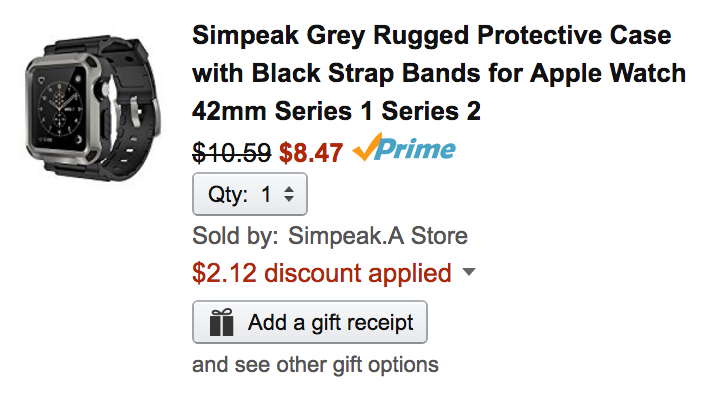 Simpeak Store (99% positive feedback from 2,000+) via Amazon offers its Rugged 42mm Apple Watch Strap with Protective Case for $8.47 Prime shipped when code 3WMHK3A7 is applied during checkout. That’s good for $5 off the regular going rate, $2 less than the current sale price and the best offer that we’ve seen. Rated 4/5 stars by 114 Amazon reviewers. Precise cutouts for Apple Watch 42 mm; Advanced front cover Snap-On design for easy installation. Fit for your Apple Watch 42mm with easy snap-on design.As the Apple Watch screen protector will affet the screen light slightly, you can remove it then it can fit the apple watch series 1 and series 2 at the same time. Durable polycarbonate hard shell armor bezel case to protect your watch face. Flexible TPU band designed according to your wrist, comfortable. Fit for 155-225mm Wrist. Different colors to choose from, 2 years warranty protection provided by Simpeak.